It's the middle of November, and yet the days are consistently warm and wonderful. At 1:30 PM today the temperature's in the mid-60s, and the wind speed (Here at Port Orford, normally the windiest point on the Oregon coast!) measures 0.0 on our weather station. Shirt sleeve weather is the only way to describe it. It certainly makes it easy to head for the mushroom fields when the weather conditions are this favorable! Yesterday's foray into the reserve revealed a world where mushrooms are still king. Golden chanterelles were the order of the day, but there were many other fungi fruiting as well. The foray was spurred by curiosity more than anything else. We were curious as to what might be happening in our traditional hedgehog (Hydnum repandum) patch. We didn't expect to find hedgehogs because we usually don't encounter them until after the first freeze. However, we certainly didn't expect to find a collection of white chanterelles and yellow feet (Craterellus tubaeformis) in the hedgehog patch, either. Typically, yellow feet show up in the reserve well after the first freeze. 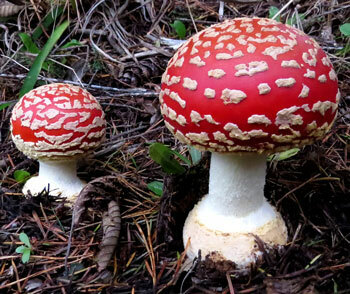 Not all mushrooms are choice edibles. Some mushrooms are simply lovely photo opportunities! Stephanie Pappas, a contributor for LiveScience.com, recently caught our attention with her list of “11 Odd Facts about ‘Magic’ Mushrooms,” i.e. 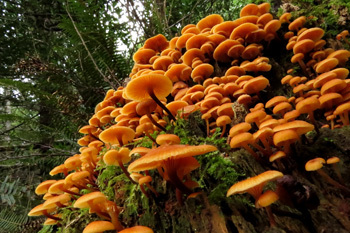 mushrooms that contain the psychoactive ingredient psilocybin. We’re providing you with some teasers from the article that should send you scurrying to www.livescience.com for more information. Don’t hesitate to do so: you really need to read her entire article in order to get the full force of these claims. 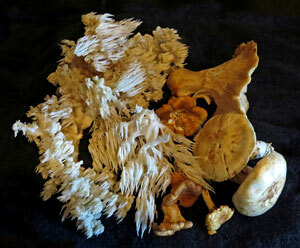 We’re thinking that the material may just give you another way of looking at our fungal world! 3. Magic mushrooms go way back – 9,000 year old rock art in the Sahara may depict hallucinogenic mushrooms. We've been traveling over the past month and away from our usual mushroom world ... but more about that exotic foray in a later post. Now that we're back on the southern Oregon coast and fully engaged in the woodlands, here's an update on the fruitings in two of our favorite locations: Port Orford and Mt. Hood. along with matsutake are amongst our recent finds. With the chanterelle bounty that is bestowed upon us this season, we've been searching for new preparations, and as we often do, we turned to our old, reliable Puget Sound Mycological Society's Wild Mushroom Recipes, second edition, 1973. Even though it's (sadly!) out-of-print at this time, it still stimulates our creativity and tastebuds with its 173 page collection of basic and old-world recipes for edible fungus. 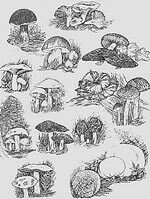 Even if our taste buds aren't aroused by any of the recipes, the mushroom illustrations dating to the early 18th and 19th centuries are always pleasing to the eye! 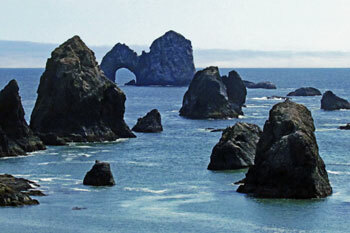 coast offers astonishing views, such as this one of Arch Rock.